When Don Foss started his career as a car salesman, he recognized early on that most of his prospective customers had shaky credit, leaving them with few options for financing to buy a vehicle. So in 1972, he started subprime auto lending company Credit Acceptance Corporation to fill that void. He knew lending money to buyers with low credit posed an inherent risk, and he knew the business couldn’t solely be focused on closing sales. It had to excel at collecting loan payments too. “I began to realize that, even as I worked as hard as I possibly could at selling cars, we would have to do better on the collections side,” Foss said in 2009, reflecting on how he’d managed to grow and sustain a business that had provided financing to low-credit car buyers for nearly 40 years. It certainly ended well for Foss, who stepped down last year, netting $128 million upon retirement by selling off his company shares. The company has acknowledged it repossesses about 35 percent of all vehicles it finances, and its aggressive methods to pursue buyers for non-payment is widely known. Debt collectors retained by the company chase after defaulted buyers for as long as 20-25 years, garnishing their wages and recouping sums that sometimes exceed two times the original loan amount. But it’s even worse than many know. The extent of Credit Acceptance’s well-oiled debt collection machine is perhaps best illustrated in the company’s backyard: Detroit. In 2017, one out of every eight civil lawsuits filed in Detroit’s 36th District Court, the largest district court in the state of Michigan, was a collection case brought by Credit Acceptance, according to an analysis of publicly available court records by Jalopnik. Credit Acceptance alone—a company meant to service subprime car loans under the cheerful motto of “We change lives!”—absolutely dominates the civil case volume of one of the country’s busiest courts. The issue was raised in three reports by a legal transparency nonprofit group called PlainSite over the last year. PlainSite had the idea to scrape court records from Detroit’s 36th District court to obtain information about CAC. It also made its source code for analyzing the Detroit court records publicly available; Jalopnik independently verified and expanded on PlainSite’s methods by building our own software to scrape the records data, and conducting additional interviews. 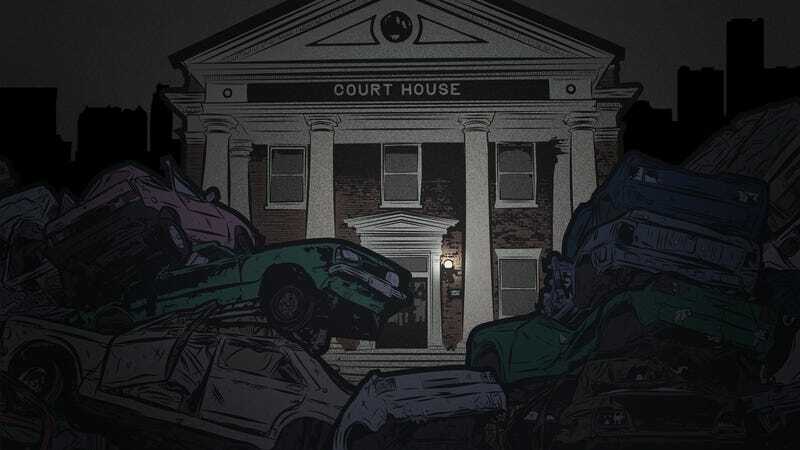 Jalopnik’s analysis also raises the specter that Detroit’s court system, which teetered on insolvency just five years ago, is now staying financially afloat with help from the fees it collects in cases filed by Credit Acceptance’s debt collectors. The nonprofit Center for Responsible Lending, in a study earlier this year on debt collection suits clogging Oregon courts, pointed out that consumers there have to pay an appearance fee to the court before they can file a response to contest the debt, or other court fees. Reached by phone, Foss deferred comment to Credit Acceptance. The lender didn’t respond to a request for an interview, and did not answer a list of detailed questions sent by Jalopnik. The lender’s practices have had lasting implications in Detroit, where one out of every three residents live in poverty and, with shoddy public transportation, a car is virtually essential for work. About 70 percent of the city’s residents have to commute to jobs in the suburbs. High interest is associated with a higher chance of default, and if a low-income driver falls into default, loses their car to repossession, and then gets hit with a collections suit, they run the risk of Credit Acceptance garnishing up to 25 percent of whatever wages they’re earning, and possible insolvency. A study published in July found a borrower who loses their vehicle to repossession is twice as likely to file for bankruptcy. Credit Acceptance filed at least 32,799 collection suits against 39,714 Detroit car buyers, more than 4 percent of all available civil cases. In 2017, the company’s collection suits represented 12.18 percent of all 32,660 publicly available civil cases in Detroit, up from just 1.45 percent in 2007. (The court reports that it handled more than 43,000 civil cases last year, and says it’s “not responsible” for any omissions in the online 36th District Court Case Inquiry System. At that rate, Credit Acceptance still comprised over 9 percent—or nearly one in 10—of the court’s caseload last year). Jalopnik counted a “case” as an action against one or more defendants; in some instances, two or more defendants are named in the same suit. The company secured judgments against 6,556 defendants that were eventually paid off in full. 6,150 of these judgments were default judgments—meaning cases when the car buyer didn’t show up to defend themselves. Defendants sometimes didn’t show up in court because they weren’t even notified to appear, several consumers told Jalopnik. In those cases, Credit Acceptance garnished at least $27.5 million in wages and income-tax refunds. Lawsuits against at least 33,158 Detroit car buyers remain pending. In those cases, Credit Acceptance has secured 22,802 default judgments worth at least $162.6 million. It’s unclear how much has been garnished and collected from those suits to date, but records show that 40 percent have been ongoing for at least 10 years, and at least 2,200 have been pending for more than 20 years. The chart below represents Open Credit Acceptance Debt Collection cases (cases in which the defendant(s) has not yet satisfied the judgement(s) against them). The numbers on the left indicate how long the cases in that category have been open. The numbers at the bottom indicate how many defendants there are in all cases in a given category. The numbers atop each bar indicate how much money has been secured in judgements against all the defendants in all the cases in that category. Each individual defendant is represented as a dot placed within the category that that defendant’s case belongs to. If you’re viewing this on a PC, hover your mouse over the dots to see the current status of Credit Acceptance’s case against this particular defendant. It’s unclear exactly what led to the situation in Detroit, although the tough economic situation for the city and its residents in recent years has certainly contributed. The company has been investigated by regulators for potential wrongdoing, and it has faced accusations in cases across the U.S. of duping car buyers into taking on untenable loans, however no current probes in Michigan against Credit Acceptance appear to exist. But what’s clear is that, in recent years, Credit Acceptance has sharply increased the number of debt collection cases it has filed in the Motor City—and in a state where its practices have been called into question before. Credit Acceptance’s main debt-collection attorney was indicted in 2005 for falsifying hundreds of court documents, claiming he’d notified consumers to appear in court when he hadn’t. Credit Acceptance had also been accused in the past by a suburban Detroit court of providing insufficient documentation to support its requests to garnish borrowers’ wages. The court’s clerk had discovered reams of errors in its filings, but when Credit Acceptance sued the court for subjecting its garnishment requests to more scrutiny, the Michigan Supreme Court sided with the lender, leaving courts barely any leeway to substantively review the accuracy of its filings. The company has long portrayed itself as a do-gooder, a lender of last resort for consumers who otherwise had no other options. But consumer advocates characterized Jalopnik’s findings about Detroit as alarming, and say it calls into question whether Credit Acceptance is even providing its customers with a sound loan product. Drew Millitello didn’t start out his bankruptcy law career by filing cases on behalf of consumers who went broke. After graduating law school in 2009, with the economy in tatters, he initially worked on behalf of creditors looking to recoup whatever they could from bankrupt companies. “Which is the opposite side of what I do now,” he said. A few years on, the caseload from representing clients of auto lenders and the county treasurer’s office took a toll. “That’s what drew me back to the other side,” he said. Millitello linked up with a few friends from high school and launched a consumer debtor bankruptcy firm called Detroit Lawyers, PLLC. Shortly thereafter, the firm put up a brief blog post about Credit Acceptance for consumers who’d faced a repossession, a garnishment, or simply dealt with a high interest car loan for a vehicle that broke down. Immediately, Millitello said, potential clients started reaching out. “It drives a lot of our clients into bankruptcy,” Millitello said of Credit Acceptance collection cases. Today, at least 25 percent of the firm’s active garnishment cases deal with Credit Acceptance, he said. “Their whole business model is based on this,” he said. A number of Millitello’s case files, provided to Jalopnik, offer insight into the characteristics of loans consumers who wind up in bankruptcy. There’s a 2001 Ford Expedition, financed with a total $11,000 loan just last year, at 22.99 percent. A 2005 Mercury went to a Detroit resident with a $16,000 loan carrying a 24.99 percent interest rate. A 2009 Ford Escape went to another resident, also for a $16,000 loan at an interest rate of 23.99 percent. One example from court documents of a Credit Acceptance loan. Low-credit buyers have few options to turn, and that’s why they’re stuck with loans that carry sky-high interest rates. If they fall behind, and their car gets repossessed, the effect can bury them, especially if Credit Acceptance takes them to court, Millitello said. Anderson bought into the Credit Acceptance motto. She’d had a car repossessed before, and the lender gave her a second chance at redeeming her credit score. Working for a janitorial service in metro Detroit, she needed a car, too. Her grandmother co-signed on the loan. The Impala didn’t last long, she said. It got repossessed twice, the second time voluntarily because the car broke down on Interstate 94 outside of Detroit and repairs were unsuccessful afterward. Even after voluntarily repossessing her car, Anderson continued making payments. Her work shifts were sporadic at the time, so if she couldn’t pay in full for a month, she immediately called the lender and worked out an arrangement. Still, she said she vowed to pay something—even for a car she no longer even had. That apparently wasn’t enough. In December 2017, she received a letter in the mail notifying her that Credit Acceptance had secured a court order to have her wages garnished. The company started having nearly 25 percent of her wages docked per check. Following the Great Recession, the rate of auto delinquencies continued to increase, as lenders loosened the purse strings for low-credit buyers to access credit for a car. Sales increased to new heights, but delinquency rates have jumped in tandem, hitting a record 6.3 million people are 90 days or more behind on their auto loan—an increase of 400,000 car buyers from a year prior. Mayer, the professor from Southern Methodist University, said he and his colleagues were surprised by the lack of prior research on the consequences of repossessions for borrowers. “Increased credit access for borrowers is essentially the ‘bright side’ of making auto repossession easy for lenders,” Mayer told Jalopnik. Michigan didn’t meet all the criteria for the researchers definition of a state that makes repossessions “easy,” but that’s only because it requires a repo agent to obtain a license. It’s smooth-sailing otherwise. The study’s findings crystallized just how much of an impact of repossessions can have on buyers who wind up defaulting on their loan payments: approval rates on credit applications are reduced for two to three years. The same for mortgage credit, by up to five years. If dealers aren’t aiding buyers in finding a car that fits their budget, that compounds an already difficult situation. If their bill gets sent to collections, the effects can be severe. And a study earlier this year found more and more consumers are trying to stick it out and deal with debt collectors instead of turning to a bankruptcy court for relief. Lawless, the University of Illinois law professor who co-authored the study, called the period when someone’s struggling before filing bankruptcy the financial “sweatbox.” Those who endure more than two years of this, he said, are called the “long strugglers.” Their time in the sweatbox is “particularly damaging,” according to the study. There’s one feature that stands out the most among this particular crowd, Lawless told Jalopnik. “They’re most likely to have a debt collection filed right before bankruptcy,” he said. One of the reasons debt collection suits have become more commonplace in recent years is partly due to the so-called information revolution, he said. More than 75 percent of consumers who responded to the researchers’ survey said they agreed to some extent that “pressure from debt collectors” contributed to their findings. At the same time, over the last decade, the study found that in-court debt collection has increased. Credit Acceptance’s debt collection efforts in Michigan ran into a roadblock in 2005, when a local Metro Detroit court returned “numerous” garnishment requests “loaded with apparent mistakes to the attorney who had filed them” on behalf of the lender, according to Human Rights Watch. Richards’ clerk asked the lender’s attorney to correct errors and provide additional supporting documentation to support their requests. Instead of doing just that, Credit Acceptance sued the court, arguing the clerk had no right to request additional documentation. When the case eventually made its way to the Michigan Supreme Court, the state’s highest-ranking judges ultimately sided with Credit Acceptance. In an opinion, the court noted that, “We recognize that [the district court] has an understandable interest in the rights of judgment debtors and in protecting them from writs of garnishment that are baseless or inflated. Richards, who couldn’t be reached for comment, was unequivocal in explaining the impact of the decision at the time. “We’ve got to have some role here,” he told Human Rights Watch. “We can’t just be rubber stamps.” But the ruling effectively stymied any efforts to apply scrutiny to the lender’s garnishment requests. That might’ve been an especially tough pill to swallow for Richards, since Credit Acceptance’s main attorney got caught up in a scandal just a few years prior. In 2005, prosecutors indicted Howard Alan Katz on 308 counts of criminal contempt of court for falsifying hundreds of court records. Katz eventually struck a “no contest” plea deal on 136 of the counts that required him to spend six months under house arrest. Katz, according to a news report at the time, filed fraudulent court documents that stated he’d notified a person when to appear in court, but in fact, he hadn’t. When the accused defendant never showed up, Katz “sought and often got a default judgment from a judge,” the report said, “allowing him to collect the past-due money by garnisheeing the person’s wages.” Katz even had vehicles seized belonging to defendants before they even knew they’d been sued. Katz, who couldn’t be reached for comment, denied any knowledge of the alleged wrongdoing and blamed the issue on a hired gun failing to properly attempt to serve the defendants with a suit. Following Howard Katz’s indictment, records show a local attorney named Jason Michael Katz started routinely representing the lender in debt collection cases. Jason Michael Katz deferred comment to Credit Acceptance and wouldn’t say whether he’s related to the lender’s former attorney. “I’m not going to answer any more questions about this,” he told Jalopnik. Once the Howard Katz case was squared away, records show Credit Acceptance started filing more debt collection suits each year against Detroit residents. In 2007, the lender represented 1.45 percent of the 36th District Court’s total caseload. Five years later, it jumped to 5.21 percent. By last year, it reached 12.18 percent. It’s a potentially startling reality for a court that, just five years ago, nearly became insolvent. The court that year posted an operating deficit of $4.5 million, leaving it facing “extraordinary challenges,” a report found. In response, the Michigan Supreme Court appointed a state appellate judge, Michael Talbot, to address the issues. Talbot spent a year and a half making staff cuts and reclassifying positions, so workers would handle expanded duties, before turning the court back over to the local administrator. The court is in better financial shape today, and it still handles one of the largest case volumes in the U.S.—including a significant amount of filings from Credit Acceptance. Talbot had no comment, when asked about Jalopnik’s findings and the implication that fees from the lender’s cases are helping 36th District stay afloat. Still, the fact Credit Acceptance’s cases now represent such a significant portion of the court’s total civil filings should be concerning to court officials, said Aaron Greenspan, PlainSite’s founder. But the personal toll a debt collection case can take on someone’s life—and how extreme the situation can get—is perhaps best exemplified several hundred miles away from Detroit, through Missouri resident Carrie Peel. As gas prices skyrocketed during the throes of the economic crisis of 2008, Peel visited a dealer called Car Time and put down $1,000 for a used Ford Taurus, financing the remaining costs with a nearly $11,000 Credit Acceptance loan. With a low credit score, she had few options, so she accepted the loan at 24 percent interest, meaning she’d wind up paying a total of $17,850. It made sense, as Peel described it to Jalopnik. Amid the worst months of the recession, Peel and her husband both lost their jobs, their house ended up in foreclosure, and with gas at $4 per gallon, they needed a more fuel efficient car. “We were trying to reestablish our credit, and, unfortunately, because our credit scores were so low, we didn’t really have too many other options other than to go to a second-chance finance company,” Peel, 40, said in an interview. That day, Peel signed a sales agreement to purchase the vehicle and drove off with the car, but Car Time never sent the vehicle’s title. When she headed back a few weeks later to get a copy, she discovered Car Time had closed up shop. Unable to afford another car, Peel was stuck in a frightening predicament. Peel reached out to Credit Acceptance for help. But as a lengthy court record later demonstrated, she perhaps shouldn’t have bothered. Credit Acceptance said she’d need to file suit and secure a declaratory judgment to win back her title. But it wasn’t until Peel lost her job and she qualified for Legal Aid that she learned, under Missouri law, “if a buyer is not provided with a title to the vehicle, the sale is void and the buyer is relieved of the obligation to make payments on the debt,” the judge wrote. Operating in Missouri since 1992, one might expect Credit Acceptance would’ve known this. But after speaking with no less than 111 Credit Acceptance employees, Peel got nowhere. Instead, the lender insisted she had to continue paying the full amount of each payment as stipulated in her sales agreement. “Never once was she permitted to speak to a supervisor even though she was promised many times,” Bernard Brown, her attorney, told Jalopnik. Testimony from Credit Acceptance showed the company employs more than 400 collectors—about one-third of its total staff—to make calls and chase down defaulted buyers for loans. Buyers hamstrung by obviously difficult situations like Carrie Peel. Jurors ultimately found Credit Acceptance had violated state laws in its handling of Peel’s situation, and awarded her $1.1 million in compensation. Judge Gary D. Witt, the appellate judge who wrote an opinion that later upheld the decision, was unequivocal about the lender’s actions. The case perhaps explains why attorney Brown wasn’t surprised by the amount of cases filed in Detroit’s district court. It’s hard to say how Credit Acceptance’s founder Don Foss feels about the stories some of his consumers have shared. Foss retired in 2017. Today, the small lender he took public 25 years ago is enjoying a warm reception from Wall Street, with its stock price jumping from $286 per share a year ago to the current price of $415 per share. The 74-year-old’s success allowed him to purchase a 13,000 square foot mansion in the Detroit suburb of Franklin. Across 3.5 acres, the Foss residence has nine bedrooms and six bathrooms. He built his empire off a business that routinely drags residents in neighboring Detroit into court day in and day out, over cases that time and again are shown to be dubious at best, over cars like Denita Anderson’s busted Chevy Impala. Update: This story has been updated to clarify PlainSite’s role in reporting this issue and publishing data that was independently vetted and verified for this story.